William Prehn Quentell (1861-1932) was a prolific inventor, a holder of at least 33 US patents (and many patents in Canada, Germany, France, and Great Britain), stretching over more than 40 years (the last was granted in 1931, the year before he died). His first patent (and most of the others) was for a typewriter, but Quentell was also a holder of many patents for calculating machines. In 1890s Quentell worked together with the inventor of typewriting and calculating machines, De Kerniea James Thomas Hiett, and one of Hiett's patents for typewriters (US547146 from 1895) was assigned to Quentell. Then from early 1900s Quentell worked together with another inventor of typewriting and calculating machines, Franklin Judge. From the beginning of 20th century, right up to the late 1920s (when he returned to typewriters), Quentell devoted most of his designs to calculators and adding machines. During this period, he worked also for a while with the award-winning Frederick Arthur Hart, one of the designers of Underwood Combined Typewriting and Calculating Machine. 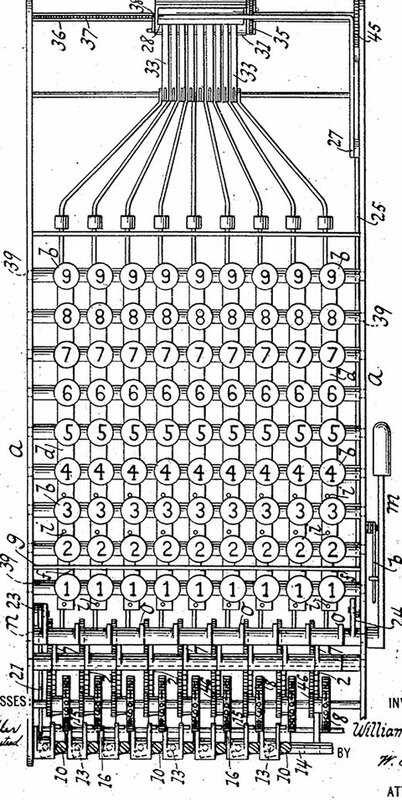 Quentell's first two patents for calculating machines were granted in 1908 (US881717 and US888262). Let's examine the operation of the machine, using the drawing from second patent (see the drawing below). The operation of the device is readily understood. As a key b guided or sliding on cross rods 39 is depressed the bar d is tilted to free itself from the detent blade or fixed bar g and its spring h then slides or snaps the bar for stud i to lock the stem of key b which is now held depressed. At the same time the pawl s is retracted the desired distance. After the desired keys have been actuated the drive lever m is moved and such lever sliding the bars d forward releases the keys which again rise to the former level. At the same time the pawl mechanism actuates the numbered wheel or wheels and the arm 24 of lever m moves the connection 25 and the receding bar d has set its type line or bar 35. The total is shown at the sight line of wheels 8 and can be transferred to the paper of rollers 31 by the operator writing the separate figures showing the total. Who was the inventor William P. Quentell? William Prehn Quentell was born in New Orleans on 8 January, 1861, the first son of William (born Wilhelm) Reinhard Conrad Quentell and his wife, Marie Therese Corine Baquie Quentell (b. 28 Aug. 1840 in New Orleans-died 1868). Wilhelm Quentell was born in Bremen, Germany, on 1 March, 1823, and came to America in 1830s together with his family—father: Wilhelm (1784-1840), mother: Anna Luise Wilhelmine Conradine (1794–1880), and brothers: Friedrich Theodore (1828-1848), and Franz Carl (1830-1858). Wilhelm and Marie Therese married on 6 February 1860 (Marie Therese was the widow of his brother, Franz Carl, who died on 23 Oct. 1858, and had one daughter, Marie Louise Wilhelmina (1857-1929), from his first marriage). When William Prehn was a baby, his family removed to Liverpool, England, where William Quentell Sr. established a merchant company (Quentell William and Co.) There on 26 May, 1862, was born William's brother Carl August (1862-1915). On 9 Dec. 1864 was born another boy, Edward Joseph, but he died only 15 months later, on 6 March 1866. In February, 1866, was born a daughter, Marie Olga (1866-1944). Sadly, in Liverpool on 29 August, 1868, only 28 years old, died William's mother—Marie Therese. William was educated in Liverpool, and attended Liverpool College. The family returned in New Orleans around 1876, where Wilhelm Quentell died on 12 January 1877. William Quentell worked for many years as a stockbroker on Wall Street (at a time when a seat on the New York Stock Exchange cost $66,000, a huge sum for the time!). He worked for Atwood Violett and Co. (Atwood Violett, an influential banker and broker from New Orleans, was brother-in-law of William, married to his sister Marie Olga since 1891) between 1901-1903, and also later as a broker on the New York Cotton Exchange for a number of years. Quentell was trying for many years to get the financing together to manufacture his typewriters. In 1898 he was finally able to form a company in New York, and in 1899 he moved to Harrisburg, Pennsylvania, to oversee production of his Keystone typewriter. However, his first typewriter venture was unsuccessful. In 1902, Quentell established another company for manufacturing of typewriters, investing a large part of his own money and that of his partners from the Stock Exchange, like Nathaniel L. Carpenter. Quentell worked as a vice president and general manager of the Postal Typewriter Co. based first in New York and then (1904) in Norwalk, Connecticut, until 1909, when it was closed. 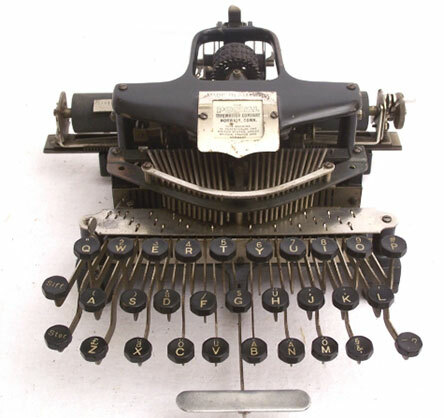 The Postal typewriter (see the upper image) enjoyed some popularity, and in the years the company was in business it produced about 30000 typewriters among eight models. The company employed 2000 salesmen in the US, and the typewriter was exported to Great Britain, Germany, Austria, France, and Russia. William Quentell gets a passing mention in most historians mostly as the inventor of the Keystone and Postal typewriters. Besides the numerous patents for typewritng and calculating machines, he was a holder of many patents for various devices like: can soldering machine (1892), lamp extinguisher (1893), font of type (GlobeGothic from 1895), hand cotton picker (1905), cotton harvester (1906), typesetting machine (1907), printing press (1908), and others. On 6 Feb. 1892, William Prehn married in Independence, Jackson County, Missouri, to Agness Roberts (b. 27 Apr. 1863 in Missouri-d. 17 Sep., 1949). They had two daughters, born in New York: Olga Marie (3 May 1900-30 Oct. 1953), and Gladys Agnes (7 Aug. 1901-8 Feb. 1966). William Prehn Quentell died at Mineral Springs, Moore County, North Carolina, on 23 January, 1932, two weeks after his 71st birthday. He was buried in Saint Louis Cemetery, New Orleans.